Earlier this month I was visiting family in southern California and returned to Descanso Gardens where I used to work. 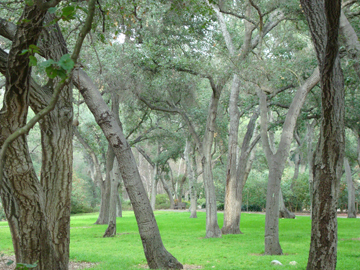 Descanso is a public garden located in La Canada Flintridge, California and in addition to camellias and roses, it has an impressive display of California live oaks, Quercus agrifolia. I have always been inspired by the beautiful structure and canopies of oaks at Descanso and it made me think of how mature trees make my favorite gardens so special. When I lived in southern California I enjoyed the oaks at Descanso because they reminded me of the trees on the east coast – trees with stature and character, size and weight. (I never was able to appreciate those wimpy palm trees!) I am so thankful to be back at the Scott Arboretum where I can appreciate our own impressive collection of oaks every day. Walking up Magill Walk with its two stately rows of swamp white oaks, Quercus bicolor, will never cease to inspire me. The canopy of the massive Q. macrocarpa that I can see in the Terry Shane Teaching Garden outside my office, fills my window with an intricate pattern of branches. Near the Q. macrocarpa and impressive elms, I’m sure many of you are familiar with the red oak, Q. rubra, that has the stone acorn dated 1880 at its base. The muscular, far reaching limbs of the Bender oak, Q. xbenderi, now a Marty Long sculpture of a twisting oak leaf, are still fresh in my mind. 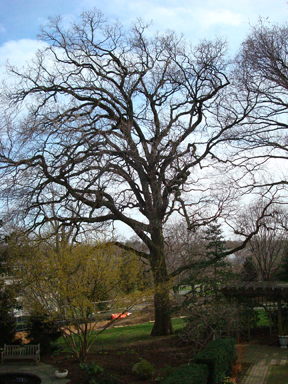 Hearing Peter Raven’s recent lecture at the Scott Associates’ Spring Festival on the importance of biodiversity, made me think about the important role the Scott Arboretum plays in preserving and showcasing our collections – especially the trees that lend structure and grace to every part of the campus. Not all mature trees in the area are lucky enough to be growing in an arboretum that is dedicated to their well-being and preservation. 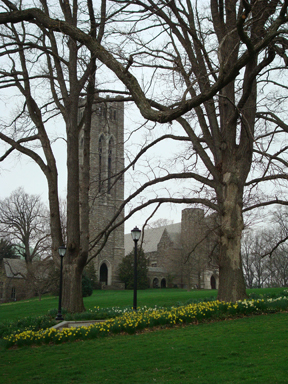 As an example, the Scott Arboretum is a member of the North American Plant Collections Consortium (NAPCC), which is a network of botanical gardens and arboreta working to coordinate a continent-wide approach to plant germplasm preservation, and to promote high standards of plant collections management. We are also working with local arborists on the best ways to prune and manage the veteran trees we have on campus. Take a minute to imagine your favorite garden – and then try and remove the trees within that garden in your mind. It is almost impossible to think of the gardens we are lucky to have near us without the fantastic trees that frame them. I invite you to walk through the Scott Arboretum to admire our oaks and my other favorites: the purple beech next to the Scott offices and the tulip trees in the Amphitheater to name only a few. Though there is so much going on right now at ground and eye level with spring blooming plants, don’t forget to look up at the emerging canopy of green.